Greensboro, N.C– A sold-out crowd gathered at Corbett Sports Center Saturday afternoon to watch the rivalry between North Carolina A&T and North Carolina Central University. A strong second-half rally from A&T contributed to the 70-64 victory at home over NCCU. NCCU record fell to 11-10, 5-2 in conference play. Denzel Keyes led the way for A&T with 20 points, 15 coming in the second half as his team made the big push to turn the tide. The intensity of the rivalrous competition showed throughout the first half. With respective explosive performances from both teams, the Eagles and the Aggies fought back and forth for the lead with the point deficit never exceeding eight. With the Aggies holding a 28-26 lead with just over one minute remaining in the half, senior point guard Raekwon Harney went into clutch mode for NCCU. Harney launched and connected a jumper with under a second left in regulation, sending the teams into halftime tied at 28. The Eagles asserted their dominance coming out of the half by going on a 20-3 run in the first seven minutes. Led by multiple buckets from Raasean Davis and sealed by a three-point dagger from Reggie Gardner Jr., NCCU led NC A&T 48-31. The Aggies called timeout and from that point began chipping away at the 17 point deficit. Led by Milik Gantz and Keyes, the Aggies started to cut their trail short with free throws and scoring in the paint. Highlighted by a 3-pointer from Kameron Langley, NC A&T gained a one-point lead over NCCU with 4 minutes to go. From then on the Aggies maintained their lead over the Eagles, sealing the deal 70-64 at home with two successful free throws from Langley. A&T’s record improves to 13-9 and 6-1 in conference play. They sit on top of the MEAC standings in first place alongside Savannah State. A&T is back in action at home Saturday against Hampton in conference play. The win improved its home record to 8-0 with its win over its buddies from Durham. 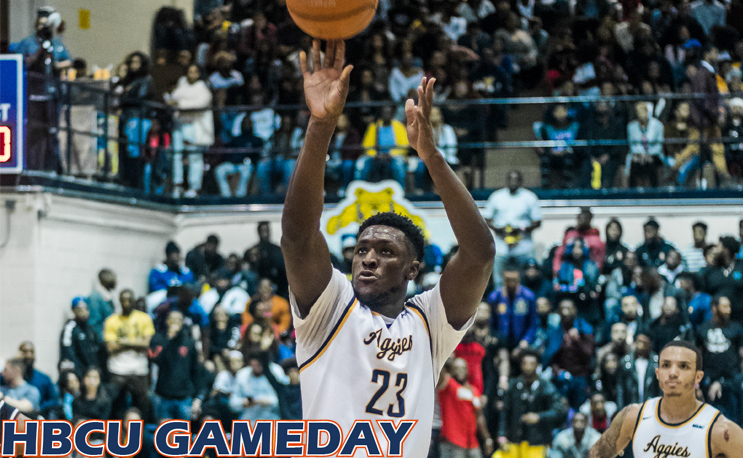 Be sure to follow HBCU Gameday on Twitter to stay updated with game stats and information.